I'm currently revising my WIP. I thought it was finished then realized it could use more polishing. That's when things got complicated. Sheila (the author who leads our critique group) said it fit before, but "the story is shifting". I know she's right. I identified said problem at home last week, but I tried to ignore it and told myself it was fine. You can't blame a girl for trying, right? I did carry on a bit at critique group, pretending to look for sharp objects to thrust myself onto, but that was just because I felt like being dramatic. I'm over it. Really. 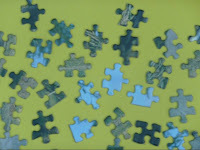 My friend George Shannon compares books to puzzles, and I totally see them that way too. If you change the shape of just one piece, you'll have to change other pieces to make it all fit together. I'm a writer. So are you. We know this whether we're published or not. Selling a book...I haven't done it yet, but it's what dreams are made of, isn't it? And not just one book. Selling that first book is only the beginning. Of course, we all know the real beginning is wa-a-ay before that, where so many of us are now: in the pre-beginning. Pre-beginners crave validation. At least I do, and I'm guessing I'm not unique in that way. Validation can come in big and little ways, like praise from our critique groups, getting page requests from agents, finding representation, or seeing growth in our work. Whichever way it comes, it's so wonderful. It can be that special something to which writers cling in order to keep warm, hopeful, and inspired when things look downright bleak. In 2005, I thought success was right around the corner. A poem I'd written had been accepted for a literary magazine. No money was involved, but I didn't care. It was a magazine I admired. Another poem I'd submitted earlier to the same magazine had been rejected, so my victory tasted extra sweet. It wasn't a book deal, but I felt validated. When the magazine came out, I had a color copy of the poem made. The poem was about my dad, so I bought my parents a copy of the magazine and mailed it to them. I framed the poem and hung it near my desk to remind myself that someone somewhere liked my writing enough to publish it. That same year, a second poem was accepted for another magazine--a very small one, but a magazine that clearly had impeccable taste. (Hee!) And guess what? This magazine paid me money. Okay, it was only $5, but that didn't matter. I had officially been paid for my writing! Thus, I was a working writer. The color copy of the check and the frame cost more than $5, but who cares? Success was around the corner. 2006 was a bit slow, I suppose, but I kept writing. 2007, on the other hand, was great! Nothing else was published, but I received lots of validation in various forms. 2008...not huge, but I definitely was growing as a writer. More mini-successes and tiny triumphs. As for 2009, I'm still living it and still loving it. Yes, I've had rejections. Yes, I've had self-doubt. Yes, I've used some swear words (the one that starts with "sh" is my fave, but I try to use it sparingly to make it count more), and I've even shed a few tears (I promise not too many on the tear front--I'm really proud of the thick skin I've developed). That said...yes, I believe in myself and my work. Yes, I continue to write, read, and learn from other writers. And yes, success is around the corner. Maybe not the next corner, but my career-starting, pie in the sky first book deal will happen. I just know it. Don't give up! Try and enjoy the ride, and cling to the positive forces in your writing universe. I will too. My hubby is great. I'm not just saying that because he's one of my followers. I really did marry a fabulous guy. Here's a picture of my husband and me on our wedding day "oh so many" years ago. I'm sharing because I have a story that relates to my husband and my writing. When my kids were still little guys, I could only write in small stretches of time, and not even every day. One night, my husband came home from work and said, "You wrote today." He was smiling and said it like it was a given. He was right--I had written a fair amount that day. But how the heck did he know? I asked him. His answer: "There's a sparkle in your eye and laundry on the floor." If you plan to enter a literary contest, I recommend putting the submission deadline on your calendar as soon as you find out the date. Then add it a second time, one month earlier, as a reminder. That way, you'll have time to get everything together and in the mail before the deadline sneaks up on you. Being a list maker by nature, I decided to make a list of some of the books I've loved. They're from various genres (though I didn't include picture books), and each book has touched me in some way. It's not a big list--it's what first came to mind when I decided to write down books that have stuck with me, forcing me to think of them months or years after reading them. I'll write them here in no particular order. I'm kind of surprised so many are not modern, but I guess it makes sense. I loved reading CHARLOTTE'S WEB, for example, as a child and as an adult, but it's so much more to me than a good--or even amazing--read; it was one of the first books that inspired me to be a writer, way back in elementary school. Right now, more books are coming to mind, mostly classics, but I won't add them since I didn't think of them when I initially wrote the list..
What books have you loved? 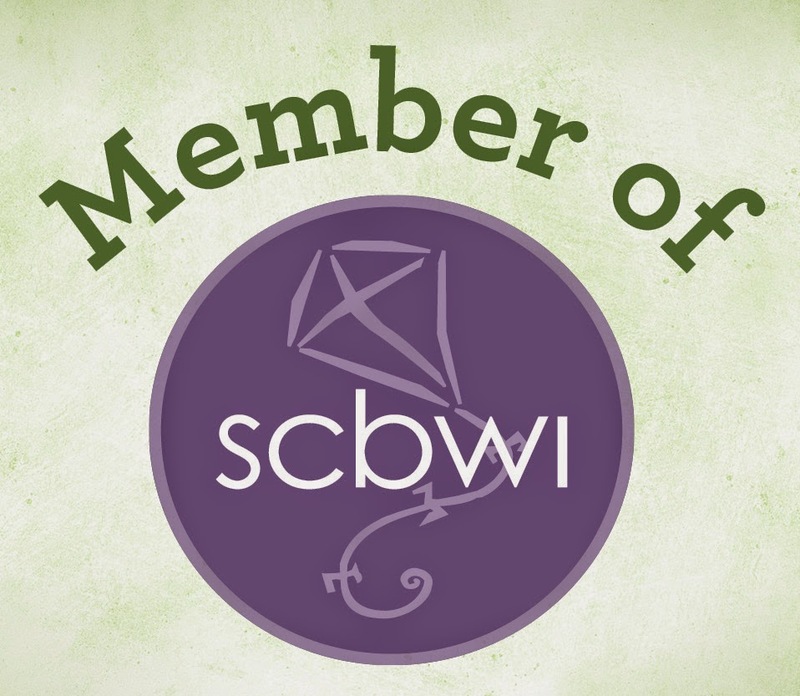 Congratulations to Jolie Stekly and Sara Easterly who together won the SCBWI Member of the Year Award at the SCBWI Summer Conference in LA last week! Woo-hoo! They have done so much for our region, it's incredible. I think every faculty member at our 2008 conference commented on how uber organized our conference was. 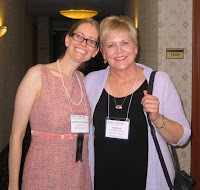 While Jolie and Sara were Co-Regional Advisors and Conference Directors, they did amazing things like putting together a keynote panel with all four recipients of the 2007 Newbery awards (one joined us via teleconference). Take a bow, ladies. You deserve it. Last Friday, Nathan Bransford linked to a post by Libba Bray that completely cracked me up. It's awesome. Seriously. Click on it and come back. I'll wait right here... Hi, again. Okay, even if you're like me and you don't have your first book deal YET, can't you already totally relate? Aaah! Good thing I love writing so dang much--and feel this is what I'm meant to do. Besides, isn't this THE coolest industry ever?! Oh, yeah. It is. I'll end with a photo I'll call "Summer Daze". Here's Thistle this afternoon making the most of the dog days of summer. Goofball. I'm loving it, and I can hardly wait to finish it tonight. Good news? It won't end there. CATCHING FIRE is Book Two in The Hunger Games Trilogy, and it comes out September 1st. Here's where I make my confession: since I have sooo many books I want to read, I don't always read beyond the first in a series; I sometimes just taste that first one and move on. That said, I will read this trilogy. Certain ones I just have to. Prime examples: the Twilight books, all seven Harry Potter books, and the Narnia series. *Have you read THE HUNGER GAMES? *How often do you read beyond the first book in a series? *BONUS QUESTION: Were you more likely to stick to a series as a child? The comments on that last post got me thinking about how debilitating it can be when our inner editors seem to be taking steroids. Does anyone have any tricks or suggestions about knowing when to stop editing? How do you know when your manuscript is finished? No, not the stupid voice I use when I'm talking to my dogs, Thistle and Pepper. Way off topic, but do any of you do that too? 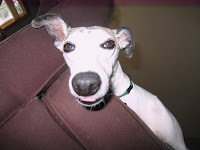 Use an embarrassingly goofy voice when you talk to your dogs? I'm just curious. I knew not to do it with my children when they were little. I used no baby talk and showed them flash cards I'd made with shapes and words so they could learn English quickly and correctly. Which they did, by golly! 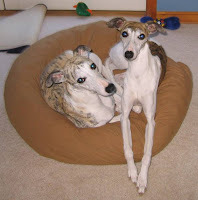 Then the kids got a bit older, and we brought dogs into our lives. Now we all sound like idiots: "Who-za good boy? Do you want your widdle ears rubbed?" Nauseating, I know. But we're happy, so what the heck. My real topic today is "that little voice". You know the one. The voice in your head that helps you edit your work. It also tells you when your manuscript is truly the best you can make it before you send it out into the world. 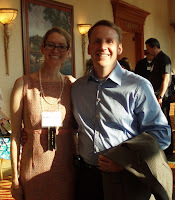 At the PNWA Conference, Deb Caletti mentioned that little voice. I'm paraphrasing, but she talked about listening to ourselves and not letting ourselves off the hook when we're revising. She was so right. Being easy on ourselves won't allow us to put our best work out there--and why would we settle for less? We all have that little voice, and I've found mine improves and gets stronger with experience. Sometimes that little voice can get mixed up with my inner critic, the one that's too tough. When that happens, I need my critique group to point me in the right direction and/or I need time to help sort things out. Then I need to listen for that voice, what it tells me to do, and follow it, even though it will most likely involve unraveling the details I worked so hard to piece together. Let's face it: writing novels isn't for wimps. COFFEEHOUSE ANGEL, the second YA novel by Suzanne Selfors, is on shelves now! It's a romantic comedy recommended for ages twelve and over. The blurb: When Katrina spots a homeless guy sleeping in the alley behind her grandmother's coffee shop, she leaves him a cup of coffee, a bag of chocolate-covered coffee beans, and some pastries to tide him over, never expecting this random act of kindness to turn her life upside down. The adorable vagrant, Malcolm, is actually a guardian angel on a break between missions, and now he won't leave until he can reward Katrina's selflessness by fulfilling her deepest desire. Fame and fortune seem like the obvious requests, but after two botched wishes, Malcolm knows Katrina is hiding something from him. But how can she tell him the truth, when her heart's desire has become Malcolm himself? Doesn't it sound great?! I'm definitely going to read it! I'll buy it this week and tell you when I'm starting it (since I just started another book). Suzanne is sooo talented and a total sweetie. Click on her website and check out the reviews! The SCBWI Summer Conference in Los Angeles starts tomorrow. I really wish I could go. 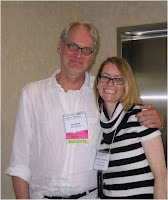 I don't mean to sound spoiled--I just went to the PNWA Conference last week, as you know, and I loved it. Plus I flew to NY for the SCBWI Winter Conference in 2007, and that's still a big deal to me, let me tell you. The flip side of a conference is that while we're attending one, we're not writing, and going to too many conferences gets pricey. Each of us really has to pick and choose what we can afford, time-wise and money-wise, each year. But you know... we can wish. Wishing is free. 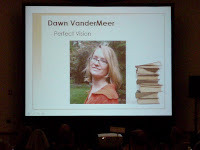 Here's a picture of the ad for the SCBWI Summer Conference that I received a while back. I'm from California. Have I mentioned that? I don't think I have. I've covered my family's East Coast roots and the fact that I live in beautiful Washington (I really do love it here), but I don't believe I've mentioned that I grew up in L.A. County. Where the conference is. Yep, it's not unreasonably far from my old house. I AM going next year. Really. 2010, baby. So...what is your dream conference or workshop? That Hawaii Writers Conference doesn't look too shabby, does it? *Karen Burns had good information in her session, Building a Platform from Nothing. She emphasized starting now, and recommended Christina Katz's book, GET KNOWN BEFORE THE BOOK DEAL. I'm going to buy that ASAP! 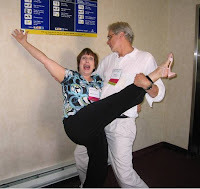 *The Dream Team: How an Author, Agent, and Editor Work Together was one of my favorite sessions, and not just because my mentor and buddy Sheila Roberts was involved. I promise--it was just that good. Sheila, Paige Wheeler (Folio Literary Management), and Rose Hilliard (St. Martin's Press) did a fabulous job explaining their roles and responsibilities. One thing Sheila talked about was how important it is to appreciate and thank the people who work so hard for you. I know she truly appreciates Paige and Rose because she tells us all the time ("us" being my critique group). They really are a dream team. *George Shannon, another good friend, moderated a panel on children's books. It was called State of the Art - State of the Biz. Deb Caletti, Kevan Atteberry, Suzanne Williams, and agent Minju Chang (BookStop Literary Agency) were on the panel. Great quotes came out of these folks. One worth noting: Kevan Atteberry said, "You can have professional jealousy, but I have professional envy." Wow. I really liked that and agreed; there is, after all, a huge difference. Each panelist contributed in a very cool way, and George, who is so knowledgeable and fun, was an insightful moderator. Joseph Finder spoke at Friday night's dinner. If you can ever hear him speak, do so. He's awesome. So funny, so bold. Speaking of bold... Look at this photo of George and Sheila! Here's a pic of George and me. Even though I don't have a book coming out yet, I'm thinking about the people who help me on a regular basis. Dang, starting with the people I've mentioned in the last two posts: Sheila, George, Martha, hubby... It takes a whole village to raise an author, I swear. The PNWA Conference was last weekend, and it was great! I learned new things, made new friends, and created new memories with old friends. One of the best parts of going to a good conference is I always walk away bursting with inspiration. It's such an exciting industry. I love it! Regarding the literary contest, I didn't place. That's okay, though. Really. Being one of eight finalists in the YA category is still huge to me. I pinned my finalist ribbon to a corkboard above my desk for extra inspiration. Here are some pictures from the night of the awards dinner. The first one (left) is a pic of Martha Schoemaker and me on our way to the ceremony. I'm with my hubby in the photo to the right. He joined me for the dinner and said he liked getting a peek into the writing world. He's soooo supportive. 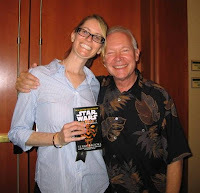 The keynote speaker Thursday night was Terry Brooks. One of the many books he's written is the novelization of STAR WARS EPISODE I: THE PHANTOM MENACE. I bought a copy for a Star Wars fan I know, and I asked Mr. Brooks to autograph it. I even got a picture taken with him. I'm cutting the conference into two posts to try and keep them bite-sized--or at least snack-sized. More next time!